If you find a wild baby bird exhibiting any of the following signs listed below, call Willowbrook Wildlife Center at 630-942-6200. View a list of licensed wildlife rehabilitators in your area. Or, find information about an injured or orphaned animal you have found. Find the information you need to assess the animal's condition, determine if it needs help and then take action. Before you make a drive to Willowbrook Wildlife Center, call first at 630-942-6200. The animal admittance area is open Monday – Friday 8:30 a.m. –5:30 p.m. and weekends 8:30 a.m. – 5 p.m. The center is closed on select holidays. Does the baby bird look like this? Is it featherless or mostly featherless and on the ground? If so, it is a nestling. A nestling bird should be in a nest. Adults are unable to lift a baby from the ground. If the original nest is intact and accessible, the baby should be returned to its nest. (Adults have a poor sense of smell and strong parental instincts, and they will not abandon a baby if you touch it.) Do not provide any food or water. 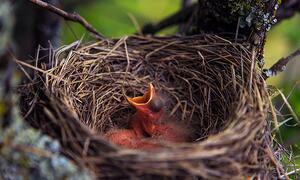 A hungry baby will chirp, helping its parents to return and locate it for continued care. If the original nest is too high, destroyed or cannot be found, make a replacement nest. Only use a container that has drainage holes on the bottom. Line the container with natural materials, such as remnants from the old nest, grass clippings or dry leaves. If you are using a plastic container, poke four holes on the sides. Take four pieces of strong string, twine or rope and tie one end of each through each hole. Tie the four remaining ends together to make a hanging basket. Place fallen eggs or nestlings in the makeshift nest. If the container is large, first place the birds in a smaller container, such as a yogurt or butter container, and then place it inside the larger lined one. If you can see the old nest but can't reach it, place the replacement nest as close as possible — ideally within 10 feet. Birds locate their nests visually. If you cannot reach a branch, get a tall gardening shepherd's hook and hang your replacement from the hook. If the parents do not return within 24 hours, call Willowbrook Wildlife Center at 630-942-6200. Use natural materials to line the makeshift nest. Hang the replacement nest from a tree branch or shepherd's hook. Or Is It a Fledgling? Does the baby bird look like this? Is it mostly feathered and able to hop on the ground? If so, it is a fledgling. If you find a bird on the ground with most of its feathers and it looks healthy but unable to fly, leave it alone and watch from a distance for its parents. It's a fledgling, an older bird that can't fly but can perch and hop. Do not move the fledgling from the general area where you found it. (If you must move it however, place it in a bush or low tree a few feet from where you found it.) Its parents are most likely watching nearby. Do not provide it any food or water. It will chirp for food, which will help its parents to locate it. Depending on the species, a fledgling lives on the ground for about two weeks. While it's learning to fly, its parents will feed and care for it and teach it how to protect itself from predators. During this time, the parents may swoop by or squawk at people or animals that get too close. All native birds — a category that includes native songbirds — are protected by the 1918 Migratory Bird Treaty Act. The law does not protect nonnative European starlings, house sparrows or pigeons. Willowbrook treats injured, ill and orphaned native animals to DuPage County. We do not accept skunks, bats, deer, beavers or trapped nuisance animals. We do not accept nonnative animals, including European starlings, house sparrows and pigeons (see photos of these animals below). We also do not accept native wildlife raised as pets, as efforts to reverse any taming or imprinting are unsuccessful. Willowbrook may have species-specific admission criteria. In the case where an animal does not meet that criteria and is unable to be treated at the center, we will work to help rescuers and other agencies find other licensed wildlife rehabilitators or referrals. The visitor center and the surrounding Willowbrook Forest Preserve are open daily 9 a.m. – 5 p.m. The animal admittance area is open Monday – Friday 8:30 a.m. – 5:30 p.m. and weekends 8:30 a.m. – 5 p.m. All areas are closed on select holidays. Get tips for common issues with wildlife, and visit Living With Wildlife. The Forest Preserve District of DuPage County's Willowbrook Wildlife Center rehabilitates native wild animals. If our center cannot care for an animal, we offer information about resources and other rehabilitators.